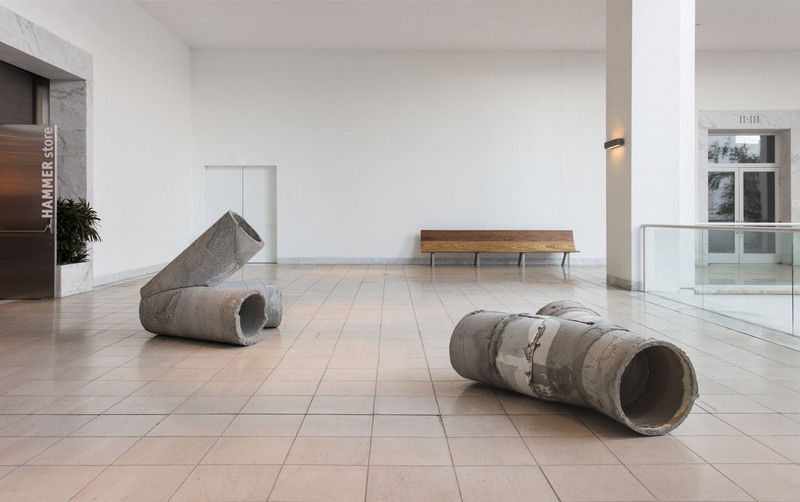 Oscar Tuazon debuts a new site-specific project for his first solo museum exhibition in Los Angeles. 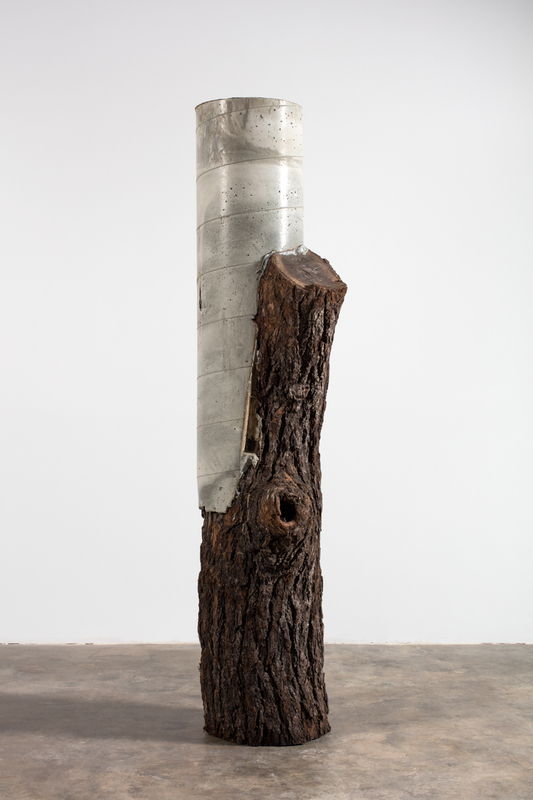 The sculptor Oscar Tuazon works with natural and industrial materials to create inventive and often functional objects, structures, and installations that can be used, occupied, or otherwise engaged by viewers. With a strong interest in and influence from architecture and minimalism, Tuazon turns both disciplines on their heads as he mangles, twists, combines, and connects steel, glass, and concrete as well as two-by-fours, tree trunks, and found objects. For his Hammer Projects show, Tuazon will present a site-specific project displayed across several spaces throughout the museum, establishing and underscoring the relationships between inside and out, the visitors and the works, our bodies and the objects. 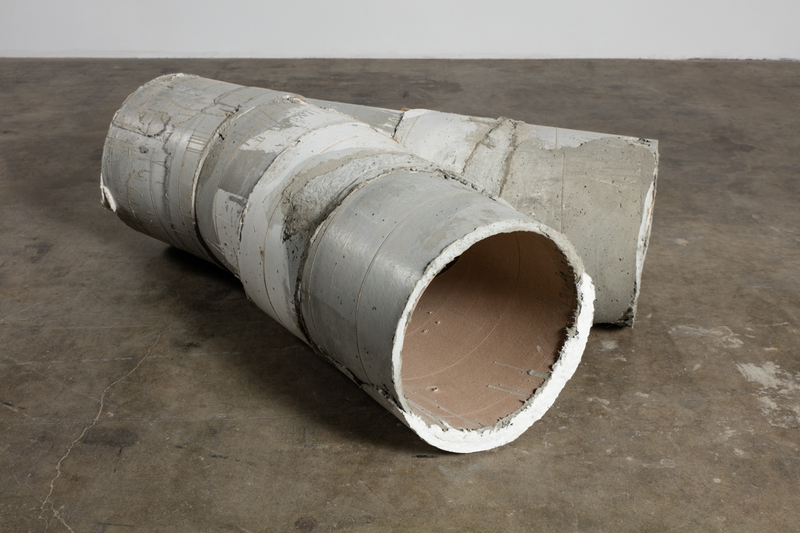 Hammer Projects: Oscar Tuazon is organized by Ali Subotnick, curator, with Emily Gonzalez-Jarrett, curatorial associate. Oscar Tuazon (b. 1975, Seattle) studied at Cooper Union and the Whitney Museum of American Art Independent Study Program, both in New York. He lives and works in Los Angeles. He has shown his work extensively in the United States and Europe, including in solo exhibitions at T-Space, Rhinebeck, New York; Le Consortium Dijon, France; deCordova Sculpture Park and Museum, Lincoln, Massachusetts; the Museum Ludwig, Cologne; Museum Boijmans Van Beuningen, Rotterdam; and the Schinkel Pavillon, Berlin. In 2012 the Public Art Fund, New York, presented three commissioned outdoor works in Brooklyn Bridge Park. Tuazon’s work has been featured in several important international group exhibitions, including the 5th Beaufort, Triennial of Contemporary Art by the Sea, Oostende, Belgium; the 2012 Whitney Biennial, Whitney Museum of American Art, New York; and ILLUMInations, 54th Venice Biennale. Architectural structures serve a specific function of providing shelter, a space shielded from the elements, separate from the environment and the unpredictable chaos of the natural world. For the artist Oscar Tuazon, architecture provides an opportunity both to engage order and to disrupt it with controlled chaos. On more than one occasion he has presented the footprint of his home inside the confines of a gallery, provoking a reconsideration of our relationship to shelter and domestic space. In the summer of 2015 Tuazon staged a performance at the alternative space Paradise Garage, in Venice, California. The freestanding garage, which was utilized as a gallery, was being torn down to make way for a new structure. In a dramatic fashion, Tuazon yanked down the garage, using a rope attached to a come-along, in less than a minute as spectators looked on, desperately trying to film the action before the building was completely flattened. This seemingly simple gesture demonstrated key aspects of his work. He is simultaneously an admirer of architecture and nature and an iconoclast, more than willing to tear something down in order to salvage its parts and resurrect it into a new form and/or function. Reusing and recycling are key for Tuazon as he frequently incorporates recycled two-by-fours, discarded building materials (including doors and windows), unwanted steel or aluminum, and fallen trees. His sculptures and installations often merge wood and tree parts with industrial materials such as metal, glass, and concrete. Integrating the organic with the inorganic establishes a tension but also in many cases creates an unexpected harmony. Tuazon produces objects and environments that draw out humanity’s relationship to buildings, interior and exterior spaces, and other objects and structures. Tuazon’s frequent inclusion of trees in his work is often linked to his childhood in the Pacific Northwest. But he has also spent a significant portion of his life living in urban environments, including New York and Paris and now Los Angeles. This duality pervades his work, especially his materials: we feel the influence of the metropolis in the concrete and steel and that of the forests of Washington state in his use of trees and wood. In Los Angeles, a city in which the urban and natural coexist, Tuazon takes full advantage of the landscape, often traveling to the nearby desert and mountains. Recently Tuazon acquired some land near the Washington coast, where he is constructing an artwork that will also function as a home. He started with a concrete slab and has slowly been building it out. The piece reflects the artist’s interest in providing a social platform and function through his artwork. He isn’t simply conceiving of and constructing objects to be looked at; he wants his viewers to actively engage with and participate in the work. The Trees (2011), Tuazon’s contribution to the 2011 Venice Biennale, took the form of an outdoor pavilion. The structure, made out of concrete walls precariously leaning on one another for support, provided a space for a variety of performers to present their works. The siting of his works also plays an important role. For his 2012–13 Public Art Fund project, titled People, he installed three distinct sculptures in Brooklyn Bridge Park: a small open cube pierced by a tree, a basketball hoop, and a tree sculpture. 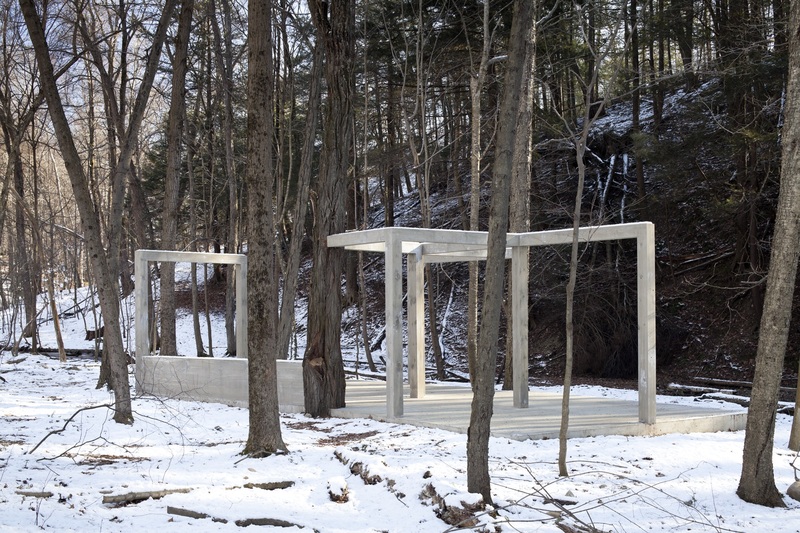 By situating his works in a park, he allowed the public’s engagement to activate the pieces, and the three works eventually merged into the landscape rather than standing apart from their surroundings. A Machine (2012), one of the works for People, consists of a forked tree planted in the grass, with a very slow stream of water emanating from its trunk. Like a tuning fork or divining rod, the tree appears to conjure up moisture from deep below the grassy surface. 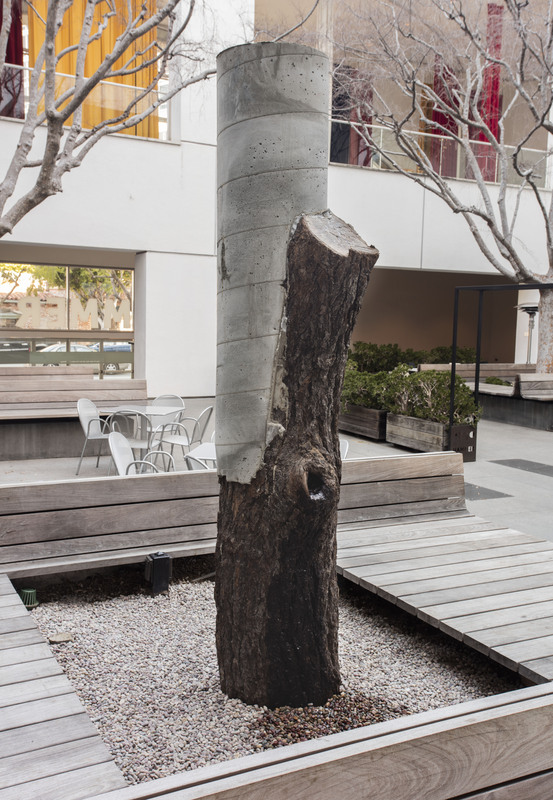 In a similar vein, Natural Man (2015), which will be presented in one of the planters in the Hammer Museum’s outdoor courtyard, features a tree that has been given a fork shape by the addition of a concrete appendage. Like A Machine, the new work emits a slow stream of water, barely noticeable at times as it trickles silently from a knot in the black oak’s trunk. The sculpture is an upright version of a shape that Tuazon has been exploring over the last few years in a variety of materials and dimensions. When upright, it resembles a Y with two arms reaching to the sky and coming together in a sturdy base rooted in the earth. On its back, however, the form becomes more of a V, its hollow legs sprawled open, serving a new function as passageways for air or water. 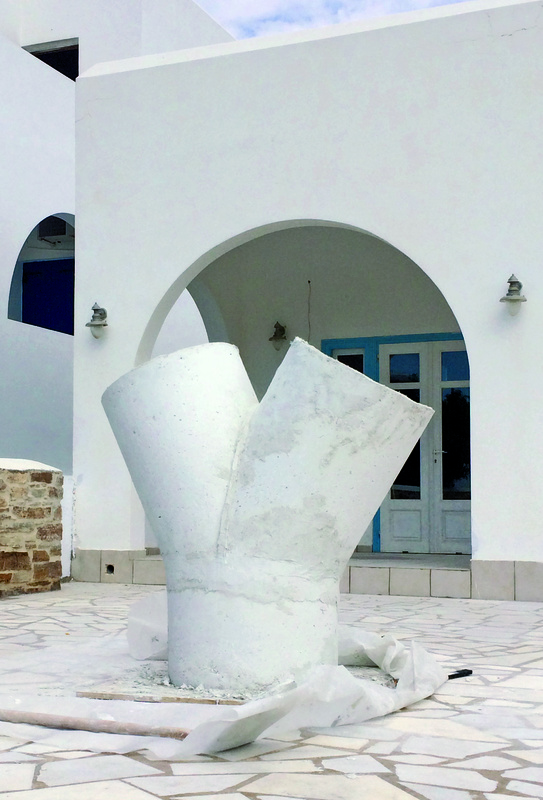 For a recent project on the Greek island of Antiparos, Tuazon inset two tubes into a hillside, and the circular openings peered out of the landscape like a pair of eyes. The openings can be tunnels to transport water or air or light—or windows into another space or time. The shape is a conduit, a connector, and yet in Tuazon’s hands it can become so much more: a bench, a monument, or an empty vessel. By exploiting the various manifestations of and uses for this shape, he opens up our experience of and relationship to this seemingly ordinary form. For his Hammer Projects exhibition, Tuazon has conceived of a presentation of four variations on the form. In addition to Natural Man, there will be a concrete version placed on its back, also situated in the museum’s outdoor areas. 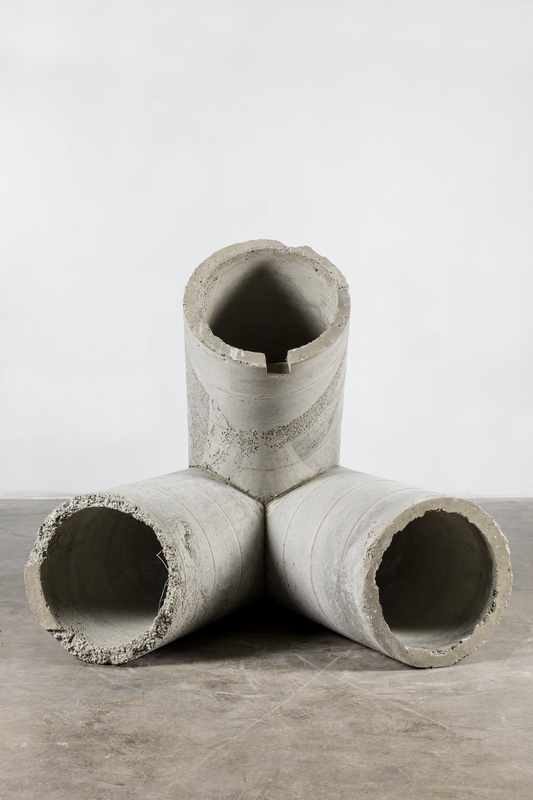 A third concrete work features an additional appendage, and this three-legged version no longer functions as a potential pipe because the three tubes merge in the back, so there is no outlet. 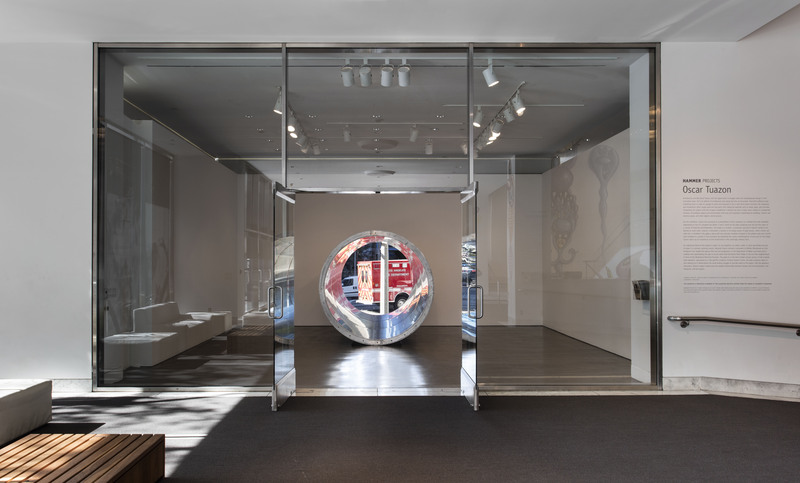 The fourth element will be a large, nearly seven-foot-diameter aluminum tube piercing the west wall of the gallery and butting up to the window. From outside, passersby can gaze into the tube and beyond, into the gallery space and museum lobby. Tuazon envisions this work as a passageway for visitors, who can walk through the tube right up to the window and gain an entirely new perspective on the interior and exterior of the building. Working with and against the architecture of the space, this piece compels visitors to reassess their physical relationship to the gallery and the sculpture. An underlying theme of the project is water. As any Angeleno can attest, water, or more specifically the lack of water, is a constant, growing concern. The story of water in Southern California is particularly poignant and dramatic. In 1913 the city of Los Angeles completed construction of the first aqueduct (233 miles long) to bring water to the city, which until then had depended on the insufficient Los Angeles River. William Mulholland, an Irish immigrant who headed the agency that was the predecessor to the Department of Water and Power, is credited with spearheading the plan to source water from the Owens River Valley. The larger-than-life story, too long to detail here, continues even today. Recently Tuazon noticed a monument to Mulholland in the Los Feliz neighborhood, in front of the Mulholland Memorial Fountain. The piece is a nine-foot riveted circular section of the original steel aqueduct, repurposed as a site-specific sculpture. Echoing Tuazon’s works, the pipe-sculpture takes on new meaning as it memorializes the never-ending struggle to provide water to the region. Water certainly isn’t the only material transported in such pipes and tubes, but it is an unavoidable reference in the midst of an environmental crisis that threatens to paralyze and transform the region. Like the aqueduct monument, Tuazon’s project underscores our tangled relationships with the environment, the industrial, and the organic.